Dec 1, 2017 ~ Often when you start noticing something it suddenly appears everywhere. Kind of like when you learn the definition of the word ubiquitous and then it is... everywhere! Recently I become obsessed with circles, curves and arches. I have been tempted to get The Book of Circles but, actually reading the sample was enough. I just don't read as much as I used to. Rather, I don't read as many books as I once did. I am constantly reading articles and stories on my computer or tablet, plus all those closed captions on the TV. I don't know why the actors mumble and whisper so much these days. So, we have made an effort to find circles and curves and even arches to photograph. And they are just.. ubiquitous. Downtown Houston abounds with examples of curves and circles. There are many round glimpses of the sky with complex structural supports. This is a hand-held 5-bracketed shot post-processed with NIK HDR Effects Pro 2. Maybe I propped the camera on a railing, but you have to be really steady to hand-hold the camera as it takes five sequential shots at varying shutter speeds. 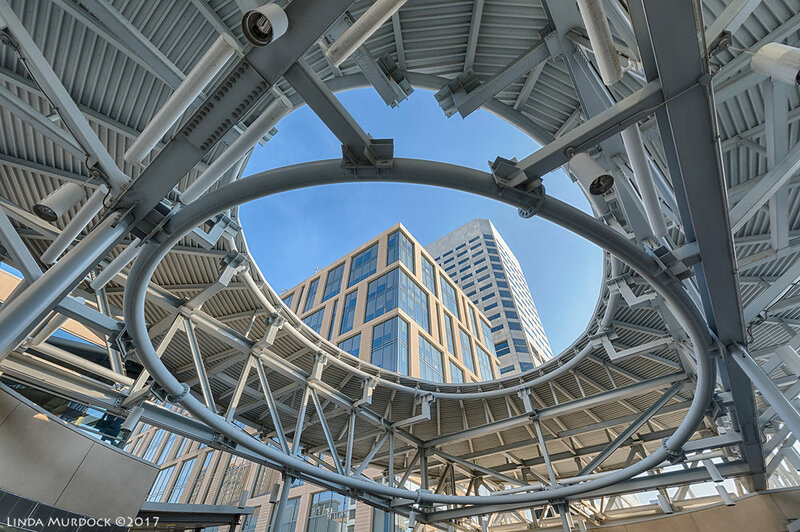 The famous Chevron (formerly Enron) circular elevated walkway is iconic for downtown Houston photographers. We have done it numerous times and each time can be different with the sky and reflections. Yes, that is the same structure in the lead in for this adventure. One of these days we are going to do a night shoot. A glimpse into the past ... or the future? This antique store in Richmond offered up a wealth of circles, curves and arches including my hat and camera. 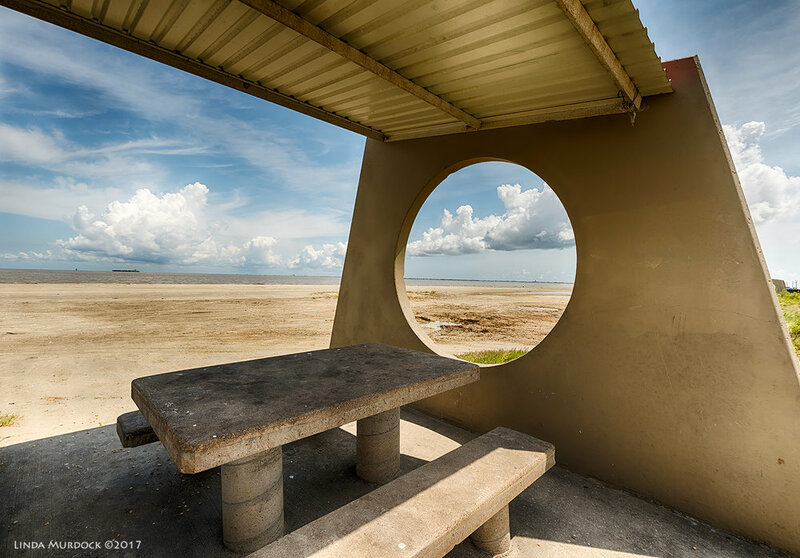 The picnic shelters at Texas City Dike are another favorite subject. You can see it is way too sunny for birds. Oh, a word of caution if you want to get low: the grass around the structures have sticker burs. And then I got a new Induro ball head for my tripod and didn't have to hold my breath taking bracketed shots. Shooting wide-angle subjects from the tripod is really different. Just tilting the camera up or down changes the entire perspective (especially with an ultra-wide like the Tamron 15-30 mm f/2.8) and you have to pay way more attention to the edges. With action shots, you can keep the focus in the center of the frame and then crop so the subject is more pleasing to view. With wide-angle images, it takes a lot more planning, thinking and less post-cropping. 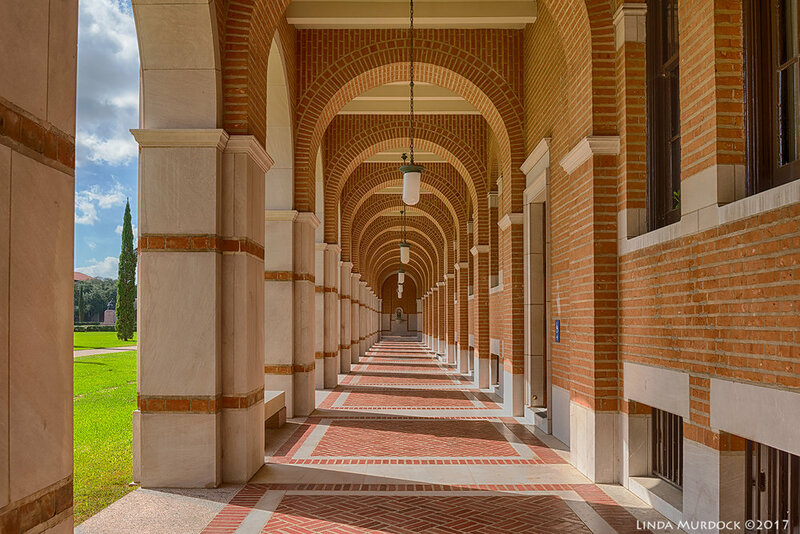 But, these images taken at Rice have been straightened in Photoshop to minimize the distortion on the sides. You know how to do that, right? Make a layer and then use Edit > Transform > Skew or Distort or Scale to tug it into shape. Show the grid to line up your verticals. There is a Perspective tool, but this is much more simple. And then I learned about ISO 64 and slow shutter speeds. How slow? As slow as it takes. The First Methodist Church downtown at Main and Clay is a solid yet soaring structure with amazing arches and stone work! I am sure the fences are fairly recent but necessary additions - we were asked politely to leave when the guard finished his shift in the late afternoon and locked all the gates. Interesting decoration of stars and circles on the wrought iron fence. And another trip downtown. Sundays are really nice, very few people and cars unless there is an event. This is an entrance to the one of the Chevron Towers and faces the elevated walkway. I love how the architect continued the circular lines on the ceiling. And the chrome racing stripes around the glassed vestibule. And ... this is Ellie, Bill's great niece. We took some photos of her on her first Thanksgiving in the backyard. The curved smocking detail of her dress, the back of the antique high chair and those plump little cheeks; you can find curves anywhere. Note: Photographing children is scary. not a minute after this was taken she pitched head first out of the chair onto the grass below. She was fine, but for the rest of the session we put her on a quilt on the ground. Maybe first thing on a Sunday morning it would be deserted. Probably not; I can visualize a whole herd of folks doing exercises out in the grass at dawn. And to get you in the mood for Christmas here is my wreath for the front of the house. I made it from an old hula hoop I sprayed copper, some battery lights from Target and a lot of stuff from Hobby Lobby. Do you ever just look at shapes when you are out shooting? Just the geometry of the composition, the patterns more than the actual subject? And what do you think about using a tripod for non-avian subjects? Let me know in the comments below!